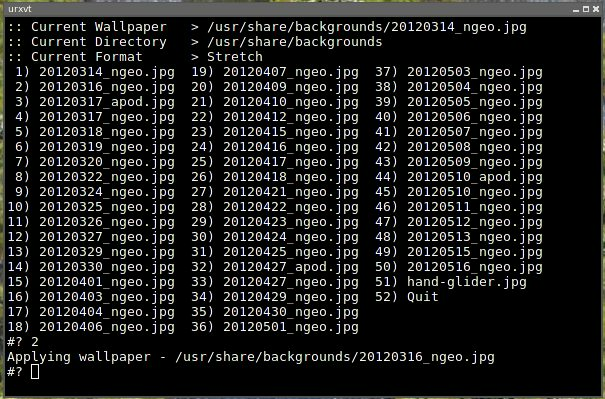 Puppy Linux Discussion Forum :: View topic - Terminal wallpaper changer. Posted: Fri 18 May 2012, 01:00 Post subject: Terminal wallpaper changer. Subject description: change wallpaper from the command line. Here is a script to change puppy wallpaper from the command line. Description remove fake .gz extension and make script executable - Right click > properties > tick 3x Exec boxes. Fixed bug with format selection. Uses rox to change the background? How about one that uses xli,xsri,xsetroot,Xloadimage or Xsetbg? Yes uses Rox for setting the wallpaper - most puppy users seem to like desktop icons so i stick with Rox - although there isn't much to the script so it could easily be changed / adapted for some other wallpaper changer etc. Hi harii4 - are any of those tools available on puppy? I really want to use xloadimage but my Slacko 5.6 says "command not found". Maybe I am just spelling or capitalising it wrong. Any suggestions please? cheers!